Team China has beaten the powerhouse Team South Korea 3-1 to win gold in League of Legends finals, one of the six eSports demonstration events on show at the 18th Asian Games Jakarta Palembang 2018, held at BritAma Arena on August 29, 2018. China's strategy of funneling resources into the bot lane strengthens Uzi which lead them to dominate the sets. Despite South Korea's desperate attempt to create an opening for a comeback, they fell in set 4, acquiring the silver. Team China was represented by Letme (RNG), Mlxg (RNG), xiye (WE), Uzi (RNG), Meiko (EDG) and Ming (RNG). For the Team South Korea, Kiin (AFS), Peanut (KDX), Score (KTR), Faker (SKT T1), Ruler (Gen.G), CoreJJ (Gen.G). China dominates the 1st set of Finals. By consistently applying pressure on Faker's Ryze, China heat up the series with the first kill. Although Kiin was able to secure both a kill and the first turret for South Korea in the top lane, Letme made the judgment to leave his lane to help his team in the team clashes. In late game team clashes, China's bot duo was able to execute their crowd control in every important moment, allowing Uzi's Varus to free hit with his reliable DPS (damage per second). South Korea rules the 2nd set. By killing off China's mid laner, xiye, multiple times, South Korea had a strong early lead. Although China had the advantage in the bot lane, the result of the game was determined by a single teamclash. With Score's Kindred as the focus, South Korea played around China's aggressiveness. After securing both the dragon and Baron, South Korea pushed the top lane to destroy China's Nexus. China once again showed their strength against South Korea as they controlled the 3rd set. From the start, team China constantly targets South Korea ADR - Ruler's Varus. With the aid of Mlxg and Letme, Uzi secured multiple kills. With Uzi's Xayah fed and strong, China took game 3, leading the series 2-1. Team China finally takes down South Korea in the 4th set. South Korea battle it out with Faker's Orianna as the core of the team. However, in every Baron timing, Korea had their members caught out and China steals the Baron kill receiving the buff. With their Baron buff, China split pushed in all three lanes and aggressively looked for fights. After destroying South Korea's inhibitors one by one, China won the akibat teamclash of the tournament to take the gold of the 2018 Asian Games League of Legends esports back home. 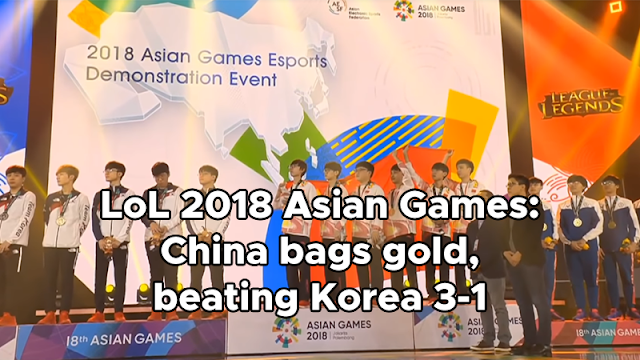 The gold medal was the third eSports medal bagged by China, following gold in the Arena of Valor on August 26 and silver in Clash Royale akibat - August 27. While none of the eSports wins will be counted in the overall medal tally at this 2018 Asian Games, it is scheduled to become an official medal event at the 2022 Asian Games.